Today, there is overwhelming evidence that harm reduction and evidence-based drug dependence treatment are highly effective interventions in reducing drug-related harms. Despite the evidence, certain governments continue to promote punishment as the main response to drug use. This is the case in many Asian countries where compulsory centres for drug users continue to be used as the primary response to drug use. These centres are often run by law enforcement officials instead of health and social workers, and “treatment” generally consists of beatings, humiliations, starvation and forced labour. Many NGOs and UN officials from around the world advocate strongly for the closure of these centres. This is the case, for example, in a recent join statement from UN agencies on the issue. 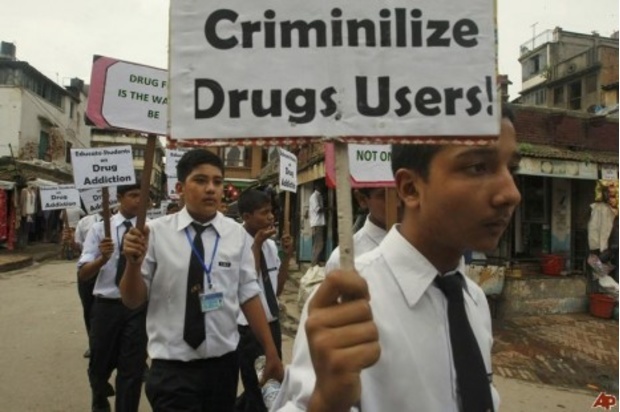 Nepal is one of the countries where compulsory centres for drug users are common practice. In Kathmandu, the capital of the country, there are more than fifty such centres. Whereas some of these centres offer friendly treatment services for people who use drugs, most of them use ill treatment and torture practices in the name of drug treatment. The first rehabilitation centre to have adopted such an arrest & punishment approach to drug dependence is called Narconon Nepal, and is run by former police officers. Other rehabilitation centres are run by “recovering dependent users”. It is common practice in Nepal for people who use drugs (including those going to harm reduction services) to be forcibly picked up by rehab outreach workers. Most of the time, these workers do so in collaboration with the local police. Once in the centres, the main rationale is that of “no pain, no gain” when users undergo “treatment” – this involves beatings and other ill treatment, while high fees are being charged to users and their family upon entry in the centres. These agencies work in close collaboration with the police and the Ministry of Home Affairs to make society “drug free”. The reach that these centres have on the media is equally worrying, as their main message consists of demonising users and harm reduction interventions. This can have a very negative effect on the Nepalese population in terms of knowledge on drug use and reducing drug-related harms, and further stigmatises people who use drugs in the country. It is high time that Nepal changes its policy on drug dependence treatment to ensure that services are based on global evidence and human rights.